Symphony No. 4 was written during the most tumultuous period of Tchaikovsky's life. It was during a period in his life when he was both recently married and divorced. During this time period he also attempted suicide. Of all his works, Symphony No. 4, is considered by many to have more emotional impact and musical structure then any of his earlier pieces in part due to the personal tragedies he endured while writing this symphonic masterpiece. 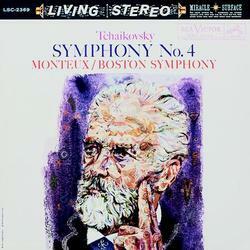 This important work is performed by the Boston Symphony Orchestra and conducted by Pierre Monteux, the well-known Classical Conductor from Paris, known for the molding of the Boston Symphony Orchestra in the mid-nineteen twenties into an Orchestra whose reputation was known worldwide as having the "French" sound and for being the experts in French and Russian repertoire. Musicians: Boston Symphony Orchestra Pierre Monteux, conductor.